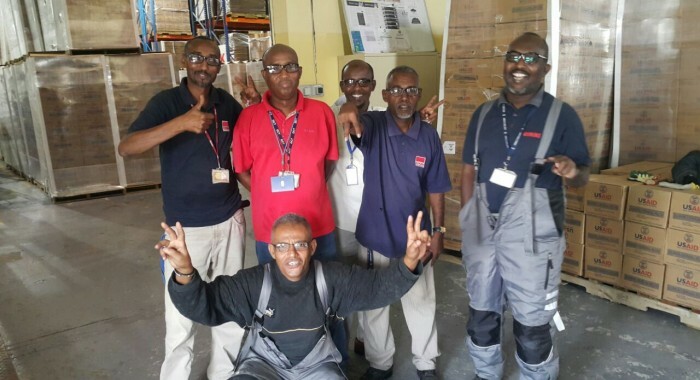 As part of their commitment to employee wellbeing and safety, BMMI Djibouti conducted medical examinations for employees and discovered that most warehouse employees and drivers suffered from pre-existing vision problems. Unfortunately, because the cost of eyewear is expensive in Djibouti, employees have been working without eyeglasses. This presents a huge risk to their own livelihoods and jeopardises the safety of others. Because BMMI always puts the wellbeing of its employees first and in order to facilitate their daily tasks, BMMI provided employees suffering from impaired vision with the eyeglasses they need. With the support of GSS HR Manager, Gregory White, and AVP of Corporate Communications & CSR, Yasmin Elisabeth Hussain, the initiative was identified and action was taken to ensure the provision of the necessary eyeglasses. Today, Ahmed Bourhan, Ahmed Omar, Ali Abdourazak, Youssouf, Houssein, Fouad and Ahmed Hassan are proudly wearing their glasses. They have all eagerly explained how they have fewer difficulties now, especially when reading forms, making their day-to-day work much easier.